A few decades ago, buying an affordable guitar would have limited you to just a few choices – usually a Strat, Tele or Les Paul variation. Rarely would you have seen something as unique as the G5425 from Gretsch’s popular Electromatic collection. This modern electric guitar sports cool retro looks, great playability and a fantastic price to boot. Regardless of your price range, this is one that pops up all the time, so we’re taking a closer look. Gretsch has pulled no punches in designing the G5425, as it sports the same vintage charm as the rest of the American brand’s catalog. Featuring the familiar Jet body, it’s a good choice for somebody who wants that single-cutaway shape, but with a little more retro edge than a standard Les Paul. The body is made from a lightweight basswood, which is chambered so it’s even lighter again. This makes is great beginner’s guitar as it’s so comfortable to hold both standing and sitting for longer periods of time. It also features an arched maple top, which is finished in a choice of a classic glossy black or a slightly glitzier silver. Both are paired with a walnut-staining for the back and sides of the guitar, while white body and neck binding finishes it all off nicely. There’s no compromise on the bolt-on neck either, which is pleasure to play. Despite the darker staining, this is a solid maple neck, with a rosewood fretboard and 22 versatile medium jumbo frets, which are easy to access with that cutaway in the treble side. The uncluttered design of this guitar allows the detailing to really stick out, so you instantly notice things like the neoclassical thumbnail fret markers and the small pearloid pickguard. Starting with the electronics and you may be excited to see a pair of Filter’Tron pickups, although don’t be too enthused – these are just standard dual-coil humbuckers designed to look like Filter’Trons. Nevermind… Still, for stock pickups, these offer a high output. You can switch between the two or play both together by using the toggle switch in the upper bout, while a master volume and tone control sit below the buckers. To keep the costs down, there is no Bigsby tremolo, which we are used to seeing on most Gretsch models. However, the fixed Adjusto-Matic bridge is a good addition, keeping tuning stable and sustain pretty long. On the Jet-style headstock sits a set of timeless diecast sealed tuners with small chrome buttons, all with a nice action. With a solid Gretsch build and no-nonsense hardware, the G5425 sounds excellent – punching well above its wallet-friendly price tag. Played cleanly, it’s warm and jazzy, while the humbuckers have good power when distortion is added – great for vintage blues through to more modern rock. A side note is that, as it’s chambered, the unplugged resonance is surprisingly loud, so it makes for a good late-night practice guitar. For the affordable price, there’s not much to criticize here – Gretsch has delivered a guitar fit for everybody from newbies to advanced players. It’s a handsome guitar with a sweet sound, whether playing through a powerful stack or completely unplugged. The comfort, as well as the affordable price, makes it a solid choice for beginners. 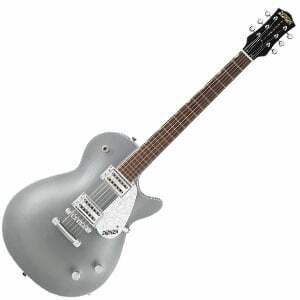 For more info about the Gretsch Electromatic G5425, click here. For more beginner’s electric guitars, click here.